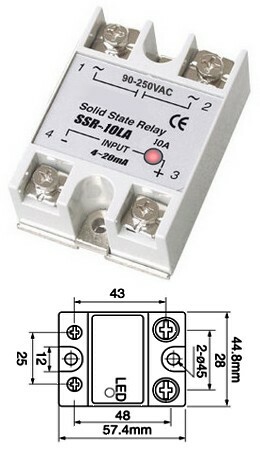 A single-phase solid state relay, with phase angle control for resistive loads, controlled from a 4 - 20mA (proportional) input. At 4mA the output is off*, at 20mA it is fully on, in between it will be partially on (i.e. reduced power). The power reduction is non linear. They are designed to be mounted on metal panel walls or other heatsink in order to keep the temperature of the metal base below 40°C. It has an LED indicator. * Note: A small amount of leakage current will be passed in the 'off' state, proptional to the total current capacity of the device.